How have I not watched this film previously? It has everything I like in a film – action, excitement, it’s an adaptation of a comic book, it’s funny and it is absolutely stunning. What a fool I am. The plot – sort of (it’s really quite complex). There is a portal that leads to another world that the Nazis try to open up. The Americans manage to get in the way and stuff it up for them, but a thing has escaped – a small, red boy with a tail and a bit stone arm thing and horns. Hellboy. Skip to sixty years later. Hellboy’s ‘Dad’, Trevor ‘Broom’ Bruttenholm (John Hurt) the scientist involved in raising him – is not too well. 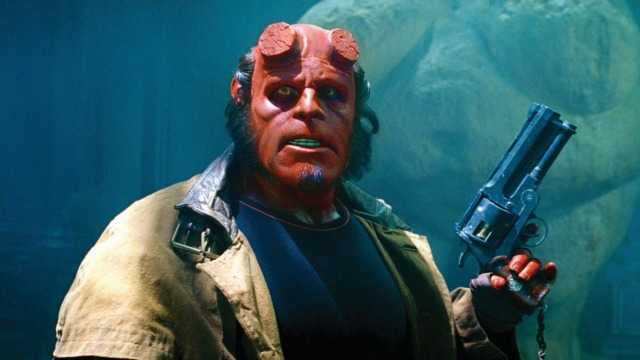 Hellboy (Rob Pearlman) is a big boy now and, with a team including a strange and quite gorgeous aqua creature man, fights other mysterious creatures and tries to stay hidden. Then the bad guys return. Oooo, exciting, fun, racey, brilliant fun. And there is more. Rock on, Hellboy.